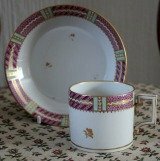 Creamware, which became Europe's greatest contribution to ceramics, evolved from these traditional Staffordshire wares. It was probably first introduced soon after 1720 and in its earliest form was composed of the same ingredients as white salt-glaze - namely, white clay from Devonshire and calcined flint. 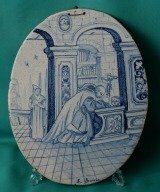 The ware was low-fired to form an earthenware and glazed with lead instead of being high-fired to form a stoneware and glazed with salt as with the white salt-glazed stoneware from which it sprang. 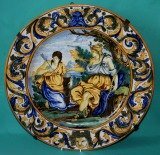 The two wares were thus intimately related and were usually produced by the same potters. 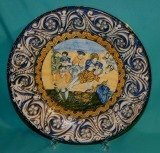 The "Cream-coloured earthenware" was at first dusted in its unfired state with dry lead ore in powder-form (galena) mixed with ground flint and given its one and only firing.The glaze produced in this way was extremely brilliant and of a somewhat golden tinge. 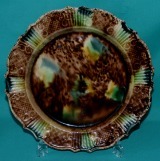 A fine English Whieldon Creamware Plate, Circa 1760, with silver-shape moulded rim, decorated with tortoise-shell design in brown. Dimensions: 24.7 cm diam. Excellent Condition. Unmarked. 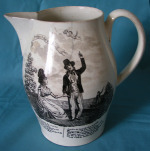 Antique Creamware Liverpool jug c.1790 transfer-printed in black, one side with figures, inscribed with the song "Poor Jack" by Charles Dibdin*, the reverse with three-masted frigate and the emblems Neptune with his trident, cannon, anchor and buoy. 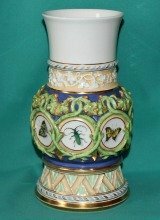 Dimensions: 7" (17.5cm) tall. Condition: Two hairline cracks, chip near the rim. *Charles Dibdin (1745-1814) was one of the most popular English composers of 18th century. 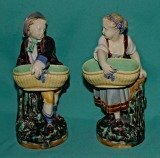 In 1788 he began to produce his celebrated one-man "table entertainments" in which he acted as author, singer and accompanist. Most of his sea songs ( "Poor Jack" among them ) were written for these entertainments. 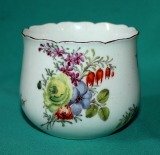 A rare Creamware Dish by Melbourne Pottery in Derbyshire c. 1770-80, deep twelve sided fluted shape, decorated with painted flowers in coloured enamels and piercing to six sides. 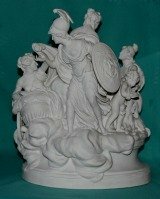 Dimensions: 27.3 cm x 23 cm. Some staining. Unmarked. 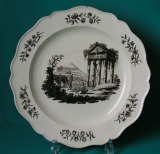 A Herculaneum Creamware Plate c.1800,transfer-printed in black in Liverpool by Guy Green, decorated in the middle with Bridge over the River Ilissus and the Temple of Pola in Istria*, and on the rim, with six floral sprays. 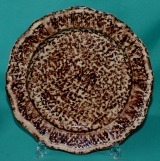 Dimensions: 10" (25.5 cm) diam. Condition: a tiny chip on the base rim. Unmarked. *This design was known as Corinthian Ruins, but was derived from plate 1 in Robert Sayer's, The Ruins of Athens, with on the left, Bridge over the River Ilissus, and on the right, the Temple of Pola in Istria. The description states that 'This temple may be reckoned in Point of Beauty, among the most valuable Remains of Antiquity'. 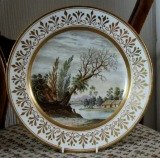 A Massive Wedgwood Liverpool-Printed Creamware Charger c. 1780, transfer-printed in black with exotic birds, with silver-shape moulded rim. Dimensions: 38 cm. diam. Condition: two hairline cracks. Unmarked. 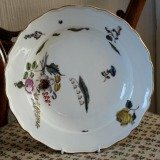 A Wedgwood Creamware Plate with elaborate feather and scroll moulded border, the central vignette decorated with exotic birds, surrounded by six more similar vignettes, transfer-printed in black, c.1780. 23cm diam. Tiny nibble on the rim. Unmarked. 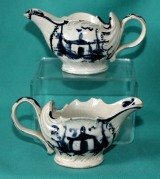 Leeds Creamware Jug and Sugar Bowl, made for the Dutch Market, "Batavian Republic" c.1790-1800, both with crossed handles and moulded leaf and flower terminals, transfer-printed in black with an allegorical subject of the Dutch Virgin holding a freedom hat and a lion surmounted by the caption: "Voor Vryheid en Vaderland", the rims painted in black. 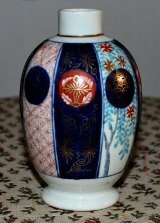 Dimensions: jug 13.5cm high, bowl 8 cm high x 13 cm diam. Condition: the jug with a small chip on the foot rim, tiny star crack on the base of the bowl. Unmarked. 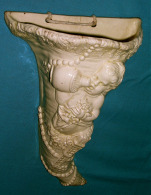 A Late 18th century English creamware cornucopia wall pocket (possibly made at the Leeds Pottery), representing Summer. 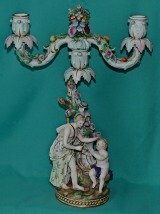 The top is bordered with acanthus leaves, the Cupid entwined by garrya swags, drinking from a vessel and harvesting flowers. 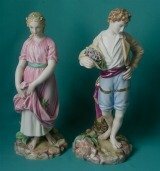 c.1790 Height: 10"(25.5cm). Unmarked. Fine condition. 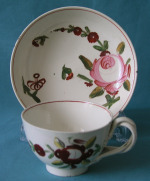 An English Creamware arcaded dish in basket weave pattern, painted in coloured enamels with flowers and an insect in the centre. c.1800. 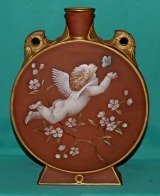 Dimensions: 9.5"(24cm) x 7.75"(19.5cm).Marks: painted cross in red enamel. Fine condition. 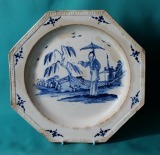 An 18th Century English (Possibly Liverpool) Creamware sauce boat, painted in under-glaze blue with stylised Oriental landscape. 6"(15cm) long. Condition: Hairline crack. Unmarked.